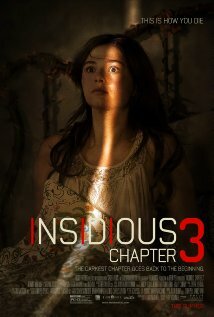 Insidious: Chapter 3 is another venture into “the further,” the dark place where malevolent spirits dwell. You may visit “the further” if you know how and if you have a good reason, but chances are a malevolent spirit will attach itself to you and will be with you when you come back. Insidious: Chapter 3 is a different story with mostly a different set of characters than the ones in Insidious and Insidious: Chapter 2. The characters who repeat themselves in all three movies are Elise Rainier (played by Lyn Shaye), the psychic, and Specs (Leigh Whannell, who wrote all three Insidious movies and directed this one) and Tucker, the ghost hunters who record (or try to) all the paranormal activity going on and provide comic relief whenever it’s needed. When Insidious: Chapter 3 begins, Elise Rainier is a disillusioned psychic. She has given up using her “gift” because a malevolent spirit has threatened to kill her if she helps any more living people rid themselves of the dead. When a high school girl named Quinn Brenner visits her, though, she decides to give Quinn a little reading because she seems like a nice girl. Quinn wants to reach her mother in the spirit world. When Elise tries to reach Quinn’s mother, she reaches instead a malevolent spirit. “When you contact one of the dead,” she tells Quinn, “you contact them all.” She warns Quinn against trying to contact her mother on her own; Quinn confesses she has already tried it but without success. Quinn lives in an a vintage (old) apartment building with her father and younger brother in an unnamed location. A man who committed suicide in the building a long time ago is now a malevolent spirit and is living in the air vent that leads into Quinn’s room. It seems that Quinn drew his attention in her efforts to contact her deceased mother. The malevolent spirits are tired of their dark world and desire more than anything a living person to attach themselves to. The man who committed suicide in the building desires Quinn. Quinn is hit by a car on the street and nearly dies. When she is recuperating at home with both her legs broken, the ghostly occurrences only increase. Knowing how much Quinn is in trouble, Elise decides to end her enforced retirement and help her. She will go into “the further” and make the malevolent spirit leave Quinn alone any way she can. She is putting her own life and reputation on the line. I like horror movies as long as they’re believable (make you want to suspend disbelief) and are not about attractive vampires and are not slasher movies with jiggling teenagers. Insidious: Chapter 3 is a solid entry in the horror genre and a worthy successor of Insidious and Insidious: Chapter 2. It’s well-made and intelligent with a lot of the creepy tension that distinguished the first two movies. It ends in such a way that there is probably going to be an Insidious: Chapter 4 if this one generates enough revenue at the box office. Even if there isn’t a chapter 4, though, the first three movies make a memorable trilogy to watch at Halloween or any other time. Posted in Uncategorized and tagged Allen Kopp, capsule movie review, Insidious: Chapter 3. Bookmark the permalink.